Data is raw, unpolished, and unbridled. In order to tame your enterprise data, you need some tools. Dashboards are one of those tools. Dashboards allow you to turn data into information. You can’t make decisions based on data, but you can make decisions based on information. But creating Dashboards in Acumatica can be confusing at first. Hopefully this post can get you pointed in the right direction. 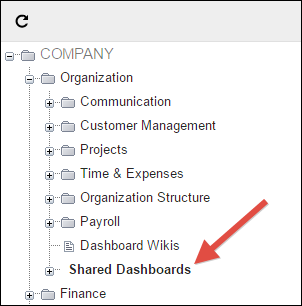 There are two types of dashboards in Acumatica. Personal: Personal Dashboards can be customized by individual users and they are specific to that user. Shared: Shared Dashboards are viewable by everyone who has security access to see them. Note: Technically there is a third type, the Company Dashboard, but as far as I can tell it basically behaves like a Personal Dashboard and isn’t really any different except for its location on the menu. Also, I’m not going to cover Personal Dashboards because, personally (get it? ), I’m not a big fan of them. My opinion is that most users don’t know how to create them and those that do might create really cool dashboards, but then they are stuck with private dashboards that no one else can see. Creating Shared Dashboards in Acumatica 5.3 can be a little confusing. You create them by manually adding an entry to the Site Map menu maintenance screen using a special URL. Definitely not intuitive, but it works. You access the Site Map (SM200520) menu maintenance screen by going to SYSTEM -> Customization -> MANAGE -> Site Map. Then you pick a place on the menu where you want to put your shared dashboards. You can really put them anywhere that you want on the menu or you can even scatter them throughout the menu in different modules, but I recommend choosing one place to put all of your shared dashboards. And I like to follow the example in the Sales Demo sample data set and put them under ORGANIZATION. Then you have to pick a Screen ID that doesn’t exist yet. I really wish that Acumatica could create the Screen ID for you, since it’s just a meaningless number, but it can’t, at least not at this point. I’m going to use SH.00.00.00 for my Shared Dashboards because I know that I don’t currently have any Screen IDs beginning with “SH”. Note the Url that I’m using. It’s a good practice to use this URL for menu headers that contain menu items. Now that we have created a place on our menu for some Shared Dashboards, we need to add some actual Shared Dashboards. We can click on the Shared Dashboards menu item that we just created (make sure to save first) in order to put our Shared Dashboards in this location on the menu. Now we do the same thing as before and make up some Screen IDs that don’t exist yet. You could really pick anything, but it’s best practice to use the same first two letters that were used when creating the “parent” location on the menu. The weird part is that you then have to use the same Screen IDs in the Url column, together with a mysterious URL that you would never know unless you went looking for it. This is why I don’t think that Dashboards are very user friendly in Acumatica 5.3. But, hey, at least you can create them. So here are my Shared Dashboards. I’m using the examples from the Sales Demo sample data set. Notice the funny URLs. Also notice that the Screen ID must match the last portion of the Url. You can probably tell from the Url column above that DashboardLauncher.aspx is the application used to launch dashboards in Acumatica. And that’s basically it. Once you do this, then you have some Dashboards on the menu in Acumatica. Congratulations! Now you need to add things to the Dashboards. These things are called Widgets. Table Widgets: These are also based on Generic Inquires, but they don’t look as pretty as Chart Widgets. It’s just rows and columns with the data, the same look-and-feel as Generic Inquiries. Article Widgets: These are Wiki Articles which allow you to be very flexible by doing things with HTML, including using images to make clickable process flow diagrams. Click here for an excellent example of a clickable process flow diagram from Doug Johnson. To add Chart Widgets or Table Widgets, you first need to browse to the Generic Inquiry that they should come from. You can actually use any Inquiry screen, not just Generic Inquiry. Let’s use the Customer Details (AR402000) inquiry in the Accounts Receivable module for our example. Go to Customer Details (AR402000) and then click DASHBOARD in the upper-right. Note that you have two options: Add Table and Add Chart. 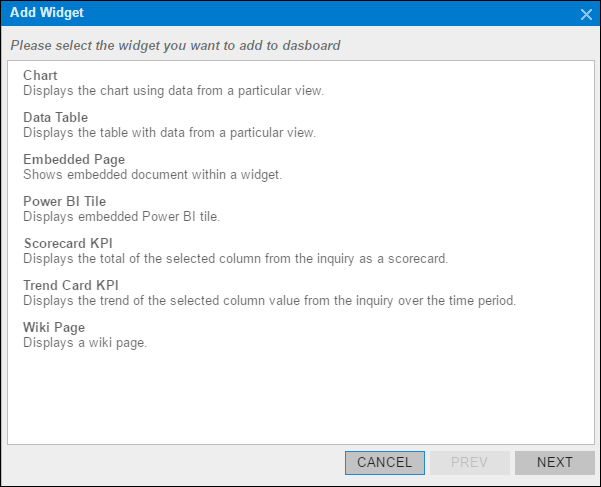 After you choose Add Table or Add Chart, you then need to choose a title for the Dashboard Widget and a Shared Dashboard where you want the Widget to land. In this example, I’m giving the Dashboard Widget a title of Customer Details and telling Acumatica that I want to put it on the Controller Dashboard which is one of the Shared Dashboards that we added to the menu earlier. If you added a Chart Widget, then you need to browse through a couple of screens in the wizard before you are finished. After you are finished with the wizard, it seems like nothing happened. This can feel a little strange, at least it did to me when I first did it. But something did happen. 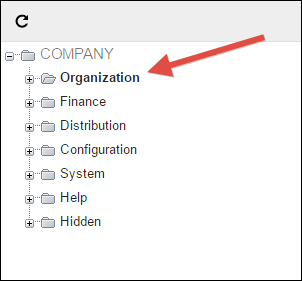 Acumatica added the Table Widget or Chart Widget to the Shared Dashboard and put it in the upper left-hand corner of the Shared Dashboard. To see it though, you have to browse to the Shared Dashboard by clicking it on the menu. Here is the sample Controller Dashboard which is a Shared Dashboard that you can find in the Sales Demo sample data set. Note the different types of widgets which are highlighted in the following screenshot. Note: Click the screenshot above if you want to see a larger version of the picture. The Sales Demo sample data set has some great examples of shared dashboards (pictured above). But there is one thing which is pretty confusing. It has a menu that is called Dashboards which I renamed to Dashboard Wikis in the screenshot above. I renamed it to Dashboard Wikis because the menu doesn’t actually contain dashboards. It contains Wiki Articles. This can be confusing to people (like me), so I like to point it out. 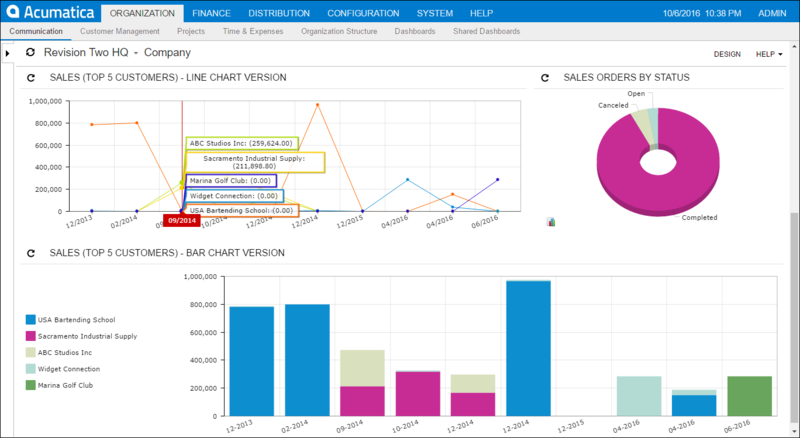 Dashboards have improved significantly in Acumatica 6.0. My favorite thing is that we no longer have to do that funky thing with the Url column in the Site Map (SM200520) menu maintenance screen. Now we have a maintenance screen for managing Dashboards, just like we already have a maintenance screen for managing Generic Inquiries in Acumatica 5.3. In fact, the Dashboard maintenance screen is in the same area as the Generic Inquiry maintenance screen. My favorite thing about this new Dashboards (SM208600) screen is that we finally have a central location where we can manage all of our Acumatica dashboards. In 5.3, they could be scattered throughout the menu and there is no central place where you can see all of them. That’s not a problem anymore in Acumatica 6.0. There are some other nice features on the new Dashboards (SM208600) maintenance screen as well. You can either put a Dashboard on top of an existing menu entry, or click the ADD NEW NODE button. Finally, no more having to know that funky URL if you want to add a Dashboard to your menu. Acumatica can create the menu entry for you, just like it does for Generic Inquiries! So I really like the nice shiny new Dashboard maintenance screen in Acumatica 6.0. In Acumatica 5.3, there are only three types of Dashboard Widgets. Power BI Tile: New! This one looks really cool, but I haven’t had time to play with it yet. What? I now get to combine the worlds of Acumatica and Power BI, but make everything appear right inside of Acumatica? Muahahaha, I love it! Scorecard KPI: New! Numbers can tell a story on their own and sometimes you just want to see a number, big and bold. Use this for big, bold numbers. You can even have some fun by editing the background color, including setting different colors based on whether or not you are under, close to, or over some target number. Trend Card KPI: New! This is very similar to the Scorecard KPI, except that you get to also display a comparison to a prior period (you can choose Yesterday, Last Week, Last Month, Last Quarter, or Last Year). The percentage change and absolute number change then display in a smaller font next to the big number. Also, you now get to start from the Dashboard when designing the Dashboard, rather than having to browse to the Generic Inquiry screens first. This is much more intuitive in my opinion. To get started, you just have to click on the DESIGN button and then start adding Widgets. You can even control the layout by clicking the EDIT LAYOUT button and deciding whether you want a free-form canvas, two even columns, etc. When you click to add a new Widget, it takes you to a wizard where you first choose which of the 7 possible types of Dashboard Widgets you would like to add. Here is a quick sample of some widgets in action: the Scorecard KPI (in green), Trend Card KPI (in blue), and Embedded Page (the two on the bottom). You can get creative with the Embedded Page widgets. Below I’m showing an exchange rate website and Excel Online. For more on embedding Excel Online within Acumatica, see this post. Before I end this post, let’s do a few more examples of widgets. This time we’ll add a Line Chart, a Doughnut Chart, and a Stacked Column Chart. I really don’t like Pie or Doughnut charts, but they seem to be everywhere so why not show one here too. Also, note in the screenshot above that you can hover over a point on the Line Chart to see the specific values for each line. You can even display the legend next to a chart like you can see in the Column Chart Widget. Hopefully this gives you a brief overview of Dashboards in Acumatica, including some of the new features that were introduced in Acumatica 6.0. Dashboards are a fairly simple tool, but the power is all in how you wield that tool. You are only limited by your creativity. What will you create?